The Town of Truro is a small, rural community on Outer Cape Cod where the quaint and unique character of "Old Cape Cod" is preserved. Truro is rich in history and strongly tied to the sea. It is in Truro where the Pilgrims from the Mayflower found a spring from which they drew their first drink of water in the new land, and where they found a cache of Indian corn, at a place named Corn Hill, that saved them from starvation after their first year. Truro possesses beautiful beaches on Cape Cod Bay and some of the most magnificent beaches on the Atlantic Ocean. A source of inspiration to artists and beachcombers alike, Truro's beaches, dunes and landscape of rolling hills are an attraction to tourists and vacationers. Home to a diverse year-round population, Truro's permanent population includes fishermen, tradesmen and an ever-growing number of retirees. Truro is home of the famous Cape Cod Light, Cape Cod's oldest lighthouse, which was first erected in 1797 and replaced by the current structure in 1857. In 1996, the 404-ton lighthouse was moved to a site 450 feet back from its former location. The move took eighteen days to complete. 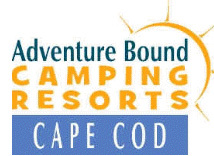 Adventure Bound Camping Resort Cape Cod, also known as North Truro Camping Area, comfortably accommodates many types of recreational vehicles and tents on its 330 sites. Guests enjoy unlimited hot water, modern bathrooms, Wifi, Cable TV, and a campground store with a variety of souvenirs and RV parts. Adventure Bound even rents travel trailers! Atlantic Ocean beaches, the historic Cape Cod Lighthouse, museums, and Highland Golf Course are within one mile of Adventure Bound, and are easily accessible by bike or on foot.